The National Association of Student Financial Aid Administrators' assisting displaced students project was acknowledged for its "power to enrich lives" and steps taken to aid a disadvantaged population. 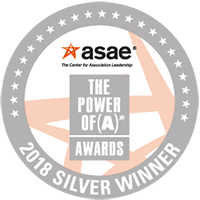 Monday, June 18, 2018—The National Association of Student Financial Aid Administrators (NASFAA) is honored to have been named one of The Center for Association Leadership's (ASAE) 2018 Power of A Silver Award winners for its assisting displaced students project. NASFAA has been working to assist students displaced by college and career school closures since mid-2015 when Corinthian Colleges, Inc. abruptly shut down, leaving many of its students with debt, but no degree and no idea where to turn for counsel. This work—which began as a collaboration among NASFAA and four other entities—led to the creation of what is now known as www.nextstepsed.org, a ticketing portal where affected students can submit requests for help with financial aid questions, and more. After submitting tickets, students are contacted by volunteers with the know-how needed to help them figure out their best course of action. While the participating organizations and funding sources have changed since the project's inception, NASFAA, with the help of a devoted network of volunteers, has been unwavering in its commitment to connecting students with seasoned financial aid administrators. These efforts will continue through December 2018, at which point the ticketing system will be shut down and a knowledge base with consumer-tested information to assist current and future displaced students will be published in its place. Through this initiative, more than 130 NASFAA members have assisted nearly 5,300 students with answers to their pressing questions about how to determine whether they are eligible and how to apply for a closed school federal loan discharge, borrower defense to repayment, and more. "Winning this award is truly a testament to the hardwork and dedication of NASFAA members," said NASFAA President Justin Draeger. "Financial aid administrators are often overworked and overtired, but they more than answered the call to donate their time to help these students whose educational plans, work, and lives had been seriously disrupted. Because of these individuals, displaced students all over the country are one step closer to achieving their educational and career goals." The Department of Education has provided some guidance for students displaced by sudden college closures, but a large gap in financial aid knowledge remains for this population. NASFAA's assisting displaced students project is nearing its end, but NASFAA's policy staff in November 2017 published a policy paper examining the existing and proposed provisions for closed school discharge from the perspectives of equity and efficiency. The report provides seven recommendations policymakers should heed in developing future regulations that underscore the importance of policies that balance the interests of students, institutions, and taxpayers in the event of school closings. NASFAA provides professional development for financial aid administrators; advocates for public policies that increase student access and success; serves as a forum on student financial aid issues; and is committed to diversity throughout all activities. NASFAA's membership includes 20,000 student financial assistance professionals at approximately 3,000 colleges, universities, and career schools across the country. NASFAA member institutions serve nine out of every 10 undergraduates in the U.S.